The latest offering in the Black Dagger Legacy series, Blood Fury is, suffice to say, awesome. The twin love stories combined with the on-going background original story lines is gripping, especially as the romantic journey of the couples is the stronger focal point. Originally the Black Dagger Brotherhood was one of my most favorite dark urban fantasy romance series. However, as the series has progressed, the romance portion/drive has diminished. Thankfully J.R. Ward has given us the Black Dagger Legacy series that truly is a spin-off that is back to the “old school.” This series works as a way to revisit the original characters as well as introducing new characters to the series. Though it is called a spin-off, this series is truly a companion to the main series. I cannot see reading either series as a solely… they do need to be read together as characters and plots overlap between them. Case in point, in Blood Fury, we are finally given Saxton’s happily-ever-after. What I loved about this book is the fact that Saxton, Blay’s ex-lover finally finds his happiness. Though the book blurb focuses on Petyon and Novo…the novel gives equal page time to both Saxton and Ruhn’s romance as it does to Petyon and Novo’s. I really enjoyed each of their journeys as well as seeing previous characters make cameos. Each couple has their own romantic challenges to overcome. This focus is what makes this series feel more akin to what I loved when the original Black Dagger Brotherhood series started. Though Peyton had quite of bit of maturing to do, he truly ends the story on the road to responsibility. This was greatly lacking in his character in the previous novels. However, just as Peyton was lost, Novo was equally lost. She had found her solace in fighting and training while Peyton found his in recreational drug and alcohol consumption. But through each of their own soul searching (and facing of their growing attraction and attachment) they help each other heal and find a new path. Similarly, Saxton and Ruhr have their own growth and soul searching to do. Saxton, the King’s lawyer and advisor, begins the novel as an empty shell. Since Blay, his former lover, chose to be with Qhuinn, Saxton has not been able to move on with his life. It is slowly suffocating him. He seems stuck in the grief the ending of the relationship has caused. However, he keeps finding himself intrigued by a new member of the mansion’s household, Bitty’s Uncle Ruhn. But no matter how tempting Ruhn is, Saxton is reluctant to find himself in another relationship where his love is unrequited. Much to Saxton’s surprise, his attentions awaken something in Ruhn he wasn’t fully aware of. Watching as they work together on an assignment for the King, I was utterly lost in Ruhn’s awakening as well as Saxton’s healing. 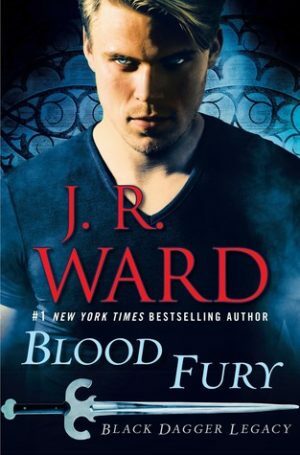 For a long time fan that was getting a bit frustrated with the latter novels in the Black Dagger Brotherhood, this new spin-off is a welcomed respite. I love having the romance central to the storyline while the war and politics are pushed more to the background (and other series). I am back being a full fan but only as I will continue to read both series in tandem. Though there are hints about the upcoming Black Dagger Brotherhood novel, The Thief, I’m more eager for the next Black Dagger Legacy novel.